Here’s another book review, but with a difference. While the subject of my last post, Florenz Ziegfeld, was only peripheral to the Hollywood story, this one is right smack dab in the middle of it. 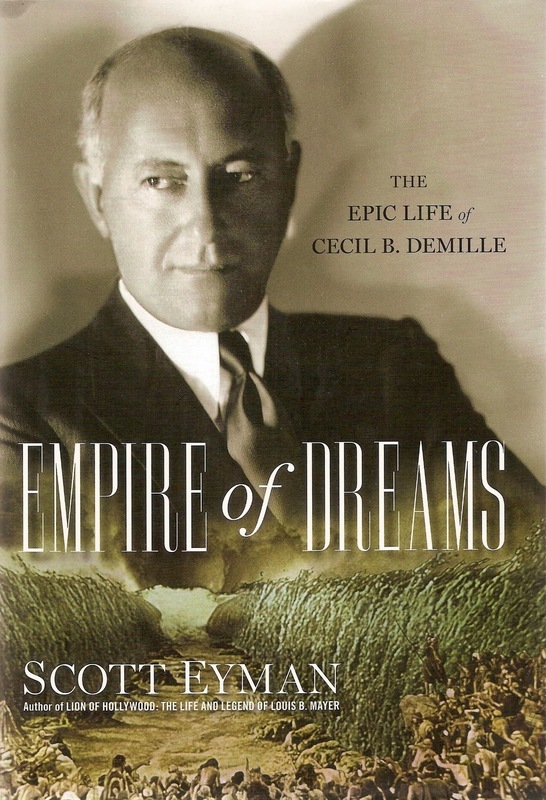 The book is Empire of Dreams: The Epic Life of Cecil B. DeMille by Scott Eyman. I’m still reading Empire of Dreams, but I know gold when I find it. Besides, when you’re digging in the Scott Eyman mine, your odds of hitting paydirt are always good. Scott wrote The Speed of Sound, one of two indispensible books on the transition to talkies (the other is Richard Barrios’s A Song in the Dark). He also wrote Lion of Hollywood: The Life and Legend of Louis B. Mayer; Mayer was often (and often justly) detested in his time, but Eyman gives us a warts-and-all portrait to counter the warts-only bogeyman of legend, humanizing Mayer and giving the devil his due. And speaking of legends, there’s Print the Legend: The Life and Times of John Ford; Eyman himself “prints the legend” along with the truth, and shows how the one derived from the other. Add biographies of Mary Pickford and Ernst Lubitsch among his other books, and Scott Eyman has covered some of the most revered and reviled figures in movie history. Well, I was getting warm — in more ways than one. In fact, as Scott Eyman proves beyond arguing, Cecil B. DeMille had a career absolutely unique in movies — or any other form of show business, for that matter. He was the first superstar movie director after D.W. Griffith, and he was still riding high thirty years later, as Griffith was fading away in boozy neglect at the Hollywood Knickerbocker Hotel. Thanks to his nine-year stint as host of The Lux Radio Theatre, DeMille was a nationwide household name at a time when few Americans knew or cared who directed the movies they saw every week. When C.B. came to Hollywood in 1913, it was a sleepy wide spot in the rural road several miles from Los Angeles, surrounded by sagebrush, rattlesnakes, wolves, deer and jackrabbits. By the time he shuffled off his mortal coil in 1959, the town was home to Ciro’s, the Brown Derby, the Hollywood Bowl and Grauman’s Chinese Theatre — not to mention the very idea of “Hollywood” itself, which DeMille and his fellow pioneers had such a hand in creating. They say one of the components of an epic story is that it portrays great changes in the land. By that measure, Eyman’s subtitle, The Epic Life of Cecil B. DeMille, is more than just a play on the kind of picture most associated with DeMille. It is an epic story, and DeMille’s was an epic life. Larger-than-life characters — that’s another ingredient of the epic, and DeMille was that, too: grandiloquent and intimidating to many, but he attracted a stock company of actors and a core of designers and technicians who stayed with him for decades, some for the rest of their lives, others for the rest of his. Scott Eyman has a historian’s thoroughness, and for Empire of Dreams he had access to Cecil B. DeMille’s archives, which run to some 2,000 boxes now housed at Brigham Young University in Provo, Utah. Equally important, he has a critic’s perception and perspective. That combination makes all his books worth reading, and this one especially, because DeMille and his career really were unique. Eyman sheds light on all the facets of DeMille’s work: the innovative artist of the early silents, the monumental presence of the talkies, and — always — the showman. I’m loving it. Ah, books! Was there really a time when I read at least one a week…sometimes more? Now, I get sleepy so quickly, it takes me forever!! But this one sounds like a must. It is indeed a must, Jean. Maybe Scott will come out with an audiobook; he certainly has the voice for it. You wouldn't have your writings on DeMille available from that period. I am writing a PhD on DeMille and changing attitudes towards the man. I would be very interested in looking at it. Kevin, my swipes at DeMille came in the course of reviewing Russell's The Devils when I was a student at CSU Sacramento; the review was published in the State Hornet (campus paper) for 10/3/71. I do indeed still have the review, and would be happy to share it if you think it'll help (must say, while my opinion of DeMille has changed, my opinion of Russell hasn't). The "sanctimonious old humbug" line was written for the Sacramento News & Review before the days of online archives; I'm afraid I can't lay my hands on that one (it's around here somewhere, but…). For The Devils, send me your e-mail and I'll send you a Word doc transcript of my review. Thanks for stopping by; hope you return often.